Eighteen months after the Erebus and Terror (sent out by the Admiralty in 1845 to search for the Northwest Passage) had last been sighted in Melville Bay, Sir John "Polar" Ross went to the Admiralty in February 1847 to offer his services as commander of an expedition to search for Franklin and his ships. His offer was turned down on the grounds that a relief expedition was unnecessary at that time. Beechey followed Ross to the Admiralty in April 1847 to be similarly rejected and it was only in the summer of 1848 that the first Franklin Search expeditions got underway. A series of expeditions set out from 1848 to 1854 but had little success apart from finding his first winter quarters near Beechey Island. John Rae brought the first hard evidence of their fate, rescuing personal relics from Eskimos who had found corpses at King William Island in 1850. Considering the matter settled, the Admiralty removed the names of Franklin and his officers from the Navy List: 'but Jane Franklin was unremitting in her efforts to elucidate further the fate of her husband and his 129 companions. In 1857-9 she despatched a final expedition in her own 177 ton screw-propeller steam yacht Fox, commanded by Captain E.L. McClintock... She instructed him to search for any possible living survivors and to recover 'the unspeakably precious documents of the expedition, public or private, and the personal relics of my dear husband and his companions' (M'Clintock 1859:13) ...After being delayed a whole year in Baffin Bay pack ice, he took the Fox as near as he could get to King William Island, which was the eastern entrance to Bellot Strait, and wintered there in 1858-9. Then, early in 1859, his sledging parties, though suffering badly from scurvy, explored the entire coast of King William Island and parts of the mainland coast to the south. Remains of the Franklin expedition were found scattered all along the western shore of the island ...A large sledge-boat contained two skeletons, several watches, five or six books, a great deal of clothing, twenty-six silver spoons and forks bearing initials and crests of Franklin and other officers, and all kinds of other articles. ...At last the long-sought written record of the expedition was found, in a cairn at Victory Point.' (R. Vaughan, The Arctic, A History, Stroud, 1994, p.159). 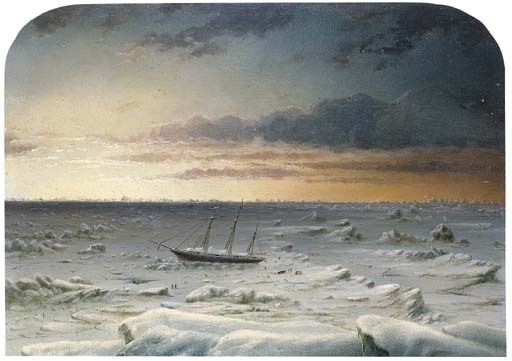 The Erebus and Terror had been beset by ice in the Victoria Strait in September 1846, Franklin died in June 1847 and Crozier took command, wintering on the ships in 1847-8 and deserting them in April 1848 to attempt a journey south towards the Back river. None of the crew survived and they were assumed to have died on their march from scurvy and exposure. The Fox returned to England in 1859 and the Admiralty's long period of fascination with the North-West Passage, which had begun after the Napoleonic Wars with Ross and Parry's expedition in 1818, concluded.